Brown is probably one of the few colors of the palette which speaks versatility. It is often credited with bringing two contrasting elements with it together; a rustic outlook and a modern charm. 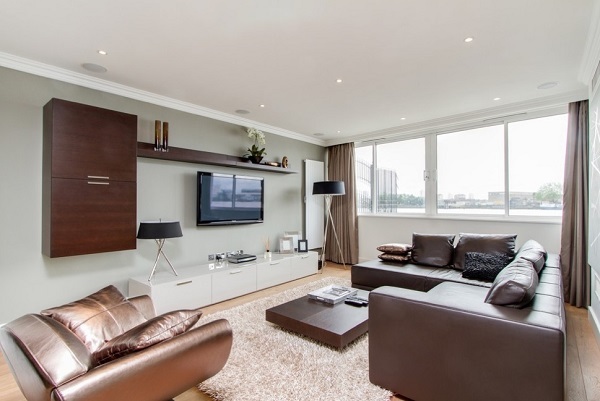 If you are pondering about painting your living room brown, then worry not – just go for it! The beauty of a brown living room is that it fits aptly anywhere and everywhere. If you think brown is not-so-cool and drab, then here are some wonderful décor ideas that can create magic for you. Like any other color from the color palette, brown has various shades, from a creamy soft brown to rich dark brown and everything in between. If you are deciding to color your living room brown, then you should opt for the shade first. You should always keep in mind that dark colors can make small rooms look smaller by visually shrinking the area of the room. But dark walls can also make a room feel warm and cozy and thus if this is the look you want to achieve then you should pick a dark brown shade. However, to be on the safe side and at the same time to create a balance, you should use light or neutral colored furniture along with dark brown walls. As brown is considered to be a neutral color don’t be shy to mix and match with other hues like bright greens, yellows, and even blues and teals. You can also go the traditional way and pair brown with colors like white, beige, and numerous shades of red. If you want a richer accent, you will have to paint your room considerably dark. But to brighten up areas in your room you can make use of lighter accents like yellow. How about accessorizing your room with lighter colored rugs, cushions, or light lamps in beige or cream shades? Also, you can incorporate airy and bright art pieces as these will help the brown pop without becoming too overwhelming. If you are sure about the idea of coating every accessory and furnishing in shades of brown, go ahead! Brown is a fun color and you can do many things with it for your living room. For starters, bring home a brown couch with a glossy texture, preferably made of higher quality foam and then make it pop with neutral colored cuddly cushions. If you want to give your room a rustic look, then pair your couch with a coffee table made of tea trunk, obviously brown colored! Or else, if you want the light to play in your rooms then how about using all the shades of brown, a lighter colored brown couch to darker toned brown couch will do the trick! If not a brown wall paint, how about a decorative brown wallpaper to enhance your décor? It will outshine itself and you can even change it after a while! Be sure to follow these tips and everything else that comes in your mind! It’s your house, after all, so don’t forget to show off your artistic skills!